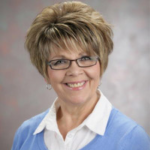 Resident Services Coordinator Cathy Roark and the staff at Riverside Lodge Retirement Community, Grand Island, Neb., are the recipients of the 2014 NCAL National Assisted Living Week® (NALW) Programming award. Riverside Lodge kicked off NALW with Family Day, which included a Sunday dinner with favorites like roast beef, fried chicken, homemade biscuits, and apple pie. Families could purchase baked goods and homemade soaps and bath scrubs—all made by the residents—to raise funds for the local Cub Scouts. The Boy and Girl Scout troops also joined the residents to make pinewood racers and rag dolls. “It is important for our residents to feel connected and vital to the community they live in,” said Deb Friend, executive director of Riverside Lodge. Residents showcased their patriotic values by writing letters and making Christmas cards for men and women serving overseas. Additionally, Riverside Lodge put on a pet show and cooking competition, and the community tailgated for University of Nebraska football game. Roark also recognized staff for their efforts. Each day, a different department of staff members were honored as Happiness Heroes and invited to share a meal with the residents. “Our staff is so ready to jump right in to encourage the residents to attend and participate in the activities, not just [this week], but all year long,” said Friend.